QPR needed a late equaliser as they secured a deserved point at Barnsley. Harvey Barnes’ stunning goal put gloss on an otherwise drab first-half as he curled into the top corner from 20 yards out for the Tykes. Adam Jackson’s header almost doubled the lead before the break, before QPR sprang into life in the second-half. Jamie Mackie, Luke Freeman and Pawel Wszolek all went close for Rangers before Freeman fired in from 25 yards after cutting in from the wing. Rangers slipped to 14th in the Championship as they failed to win for a sixth time in seven games, while Barnsley are now two points and one place above the relegation zone. 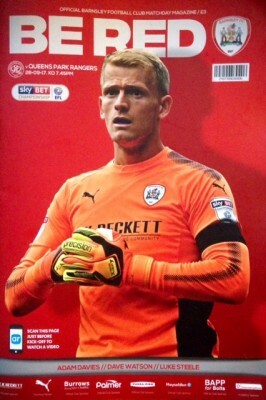 Alex Smithies made a great save from Chelsea loanee Ike Ugbo as Barnsley tried to double their lead eight minutes after the break, while he was also called upon to stop Adam Hammill’s dipping volley 15 minutes later. But it was Rangers who had most of the chances – almost levelling when late substitute Matt Smith had two good chances before Freeman’s excellent equaliser. There was no real flow to the game early on. Josh Scowen headed over, Jamie Mackie shot wide but neither keeper was troubled very much. The home side opened the scoring with a rasping 20-odd yard effort after Steven Caulker had blocked the first attempt. Once again it wasn’t until the second-half before the R’s really got going. Alex Smithies made a couple of excellent saves, including one in which he successfully tipped the ball over the bar after it had been lofted at him on the half-volley from something like 30 yards. We began to rise from our seats as Pawel Wszolek was set-up by Luke Freeman and as he homed in at an angle, he screwed the ball well wide from just 8 yards. The R’s had a big shout for a penalty after Massimo Luongo had seemingly been impeded in the box by George Moncur. Matty Smith had been introduced on 74 minutes and he wasted a golden opportunity when he could only lightly poke his effort from close range directly at the keeper. Rangers finally got their just rewards in the 87th minute when Luke Freeman let fly from fully 25 yards in front of the away contingent, following an assist from Pawel Wszolek. The keeper may have got a touch, but the ball ended up in the back of the net to the huge relief of the travelling R’s fans.